MIAMI ? 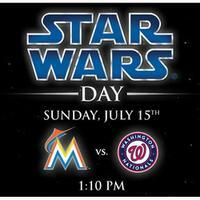 The Marlins today announced they are teaming up with Lucasfilm Ltd. to host the 2nd Annual Star Wars Day on Sunday, July 15th when the Marlins host the Washington Nationals at 1:10 p.m. The ?Jedi Pack,? which includes a game ticket and a Star Wars t-shirt, is available individually for $25 or at a group price for $23. Proceeds from packages sold will benefit Stand Up To Cancer. In addition, Marlins retail stores will be selling the t-shirts separately and proceeds from those sales will also benefit Stand Up To Cancer. A Star Wars VIP online auction is also available. The online auction package includes the Family Four Pack to the Star Wars Celebration in Orlando on Aug 23-26, four tickets to our Star Wars Day on July 15, four Star Wars Day t-shirts and a pre-game meet and greet with one Marlins player. The auction ends on July 12th. All proceeds from this online auction package will benefit Stand Up To Cancer. To enter the auction, please visit www.marlins.com/auction. Fans are encouraged to dress up as their favorite Star Wars characters. There will be a pregame Star Wars party on the West Plaza complete with photo opportunities with Star Wars costumed characters. The game will feature a first pitch by Darth Vader. Star Wars themed activities will take place during the game, including a Star Wars Day twitter contest in which fans tweet photos of their creative costumes for the chance to win special Star Wars prizes.